I love your platform. It is Excellent!!! Tons of great features. WOW!!! I have been marketing mobile sites for about 3 days and I have already closed 2 sales and have a huge amount of potential prospects. Your platform is so easy to use. I created a demo site in about an hour and I will sell it for about $400. I love making $400 an hour. This opportunity is so huge and it is now! While everyone else is pushing the same SEO services I am slipping in with mobile and then I will ultimately get all their business. I have tried a few other platforms and this one is by far the easiest to use with the most features. My 12 year old son can build one of these in about an hour. Thanks again for a great opportunity and I am looking forward to becoming your #1 reseller! The opportunities afforded by brick&mobile to build a mobile marketing business is truly outstanding. With brick&mobile I intend to surf the mobile revolution wave to its summit. Keep up the good work! Only working on one site at the moment but have another interested. Exciting product! Excellent service and training — Even though our clients prefer us to build HTML5 Responsive sites instead of adding a separate mobile site — it is great to know we have this platform to offer our clients should they want a separate mobile site. ~ Michele K., Yireh Enterprises, Inc.
Good standard mobile web content management system. Best mobile platform out there – by miles. Always innovative and evolving. Great support team. I love the product! I really like designing the websites for the customers and working with them. I am new to this and going really slow, but your team has been patient and very helpful in answering all my questions. Thanks. I’m putting together a promo and hope to get a good enough response to move up to the next level. brick&mobile is an amazing platform for mobile site building. The support is second to none. The training in the members area, and the support and guidance in the support site is truly comprehensive. The platform really builds premium mobile sites that are unique, and stylish. I know that my company will be very successful because I use brick&mobile as my platform. 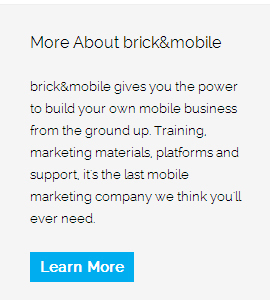 Hello brick&mobile,Your mobile websites and added features are by far the best I have seen in the industry. Your customer service is fast and most importantly available! Recently I was unable to pay my bill and I was given an extension not once but twice. No other business I have been involved with has done such a thing! Thank you for creating a great product and for having a first class organization!To your continued success. brick&mobile is a great help in my goal to improve my client services. I don’t have to worry about designing templates or anything else. Everything is there for me. And if I have to customize, I always can do it. I just want to let you know that your service to me has been outstanding! I can't recall in recent memory, receiving this high level of impeccable customer service with an effortless will to go the extra mile to make me smile! You have answered questions, proposed & implemented solutions, and kept me abreast thru the entire process of of setting up my White Label Business with Brick & Mobile! Love your customer service… Always ready to give me back a quick response to my needs….Thanks! Great support! The continued improvements make me extremely happy to continue with your service! brick&mobile is the greatest Mobile Business provider on the Planet! Love the support both chat and email. Friendly and fast. I think you have the best business model going. I absolutely love the simplicity and how user friendly the platform is in creating mobile websites. I’ve was able to do 13 demo sites for business within the first 2 days of getting access. Totally awesome. Your services are amazingly sophisticated at these prices, your Mobile CMS is the most impressive mobile building platform out there on the market and the support is superb as well! I love your platform and I am very thankful that you’re innovative and working to provide features that will make this one of the the best white label platforms available. It already is, in my opinion. I’ve been involved with mobile marketing for almost 2 years now, and I’m always looking for new products to offer my clients and more cost effective ways to fulfill my client’s orders. Until I found brick&mobile, I had to hire a web designer for each new mobile optimized site I needed. brick&mobile has made it infinitely easier! Creating a custom mobile version of my client’s sites takes minutes rather than days, and installation is simple. Mobile web sites are a huge opportunity right now, brick&mobile’s custom Mobile CMS (content management system) makes it simple to create a very high quality site for ANY client. Thanks Kevin for creating a fantastic product! The best Mobile Websites I’ve seen and believe me I’ve seen many! I must say, you guys rock with this product and am having a blast with it. I bragged to my family about it over Thanksgiving weekend and now my sister wants in… Thanks again, great job! Great platform – I really see the potential!!! brick&mobile is a top notch company focused on cutting edge mobile technology to assist the marketer provide best in class mobile services to their customers. Looking forward to having the complete solution here in the UK. The team in brick&mobile is wonderful and very helpful. Hi, Just a quick note to tell you that one of the best thing I have done for my business is to acquire the brick and mobile system. I call it a system as it’s not just ‘stuff’ for building mobile sites because that’s just technology. As good as that is it is the psychology of how to use the tools. That is where the real value is and you provide that by the truckload. Thanks, a very satisfied client. My client is happy with his site. The CMS is great!